A Little Holiday Magic in October! Welcome to our Stamp of the Month Blog Hop! 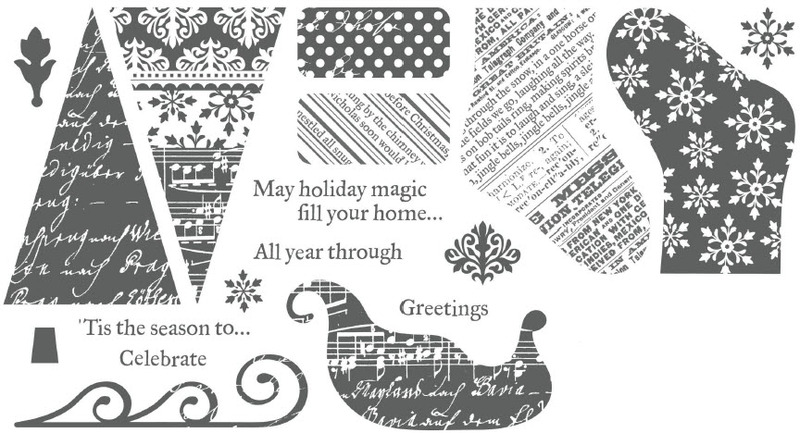 We will be featuring October's SOTM, Holiday Magic, a set of 18 stamps. If you have come here from BETH NAUMANN'S BLOG, you are on the right path! The blog hop is a great big circle, so you can start here and work your way all around. If you get lost along the way, you’ll find the complete list of participating consultants here. Christmas in October you say? Actually October is the perfect month to get this stamp. If you love to make your own Christmas cards, you can get started early. I have to say, it was a little hard for me to start these cards since I've been in such a 'Fall Mode' lately. But once I started the first card, ideas just kept coming to create more. So I've got three cards to share with you! and ran Natural Hemp (Z280) through them. With the Christmas Tree card, you can see how the front of my card covers the inside sentiment. I used our new Foundry Metal Ribbon Slides ( Z1460) on the cranberry ribbon. a dot of Silver Glitz Glitter Gel (Z1482) to give them sparkle. Pearl Opaque Adhesive Gems (Z1336) round out the corners of the card. What a great set of stamps! Remember, you can ONLY get it during the Month of October! It is just $5.00 when you purchase $50 in Close To My Heart Products That is a great discount off of the retail price of $17.95. Contact me to order yours today! Now keep on Hoppin' and see more great artwork from our Close To My Heart Consultants'. 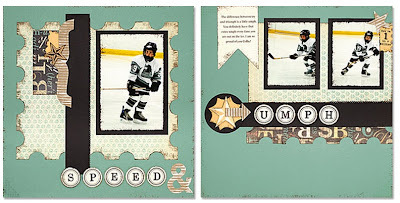 Continue on to Shannon Beck's Blog to see what she has created for you! If you read my post the other day, you know I was getting tired of making fall cards! I've got some really pretty winter and Christmas themed paper that I've been wanting to play with not to mention a bunch of new stamps to go with them! So, to ease into the winter/Christmas season I decided to start with winter card with ONE snowflake. But get ready.... for the next few weeks this one snowflake will bring on more wintery cards! 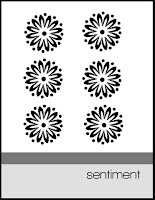 I'm submitting this card for 2 Challenges this week - Heart 2 Heart and Mojo Monday. 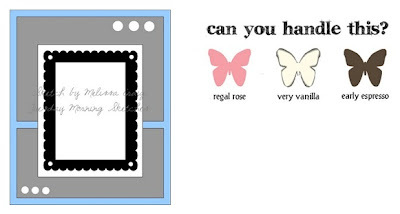 Over at H2H the challenge is the make a card with only one stamp - and that stamp must be a sentiment ONLY. Mojo Monday provided the sketch that I cased for this card. I had a choice of round or square so I went with the square sketch. For this 6x6 Card I used White Daisy, Crystal Blue and Petal Cardstock. I used a snowflake from the Top Coats Icing Overlays (Z1468) layered on top of a snowflake I cut on Crystal Blue cardstock with the Art Philosophy Cricut. I used a Designer Rhinstone Brad (Z1360) to give the snowflake extra bling! My sentiment is from the stamp Christmas Love (D1492). 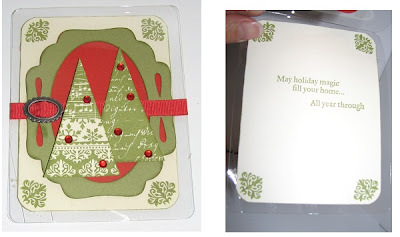 This sentiment stamp is a great one to have for Christmas cards! See the complete stampset HERE. It has 12 different stamps and includes a tree, ornaments and more! 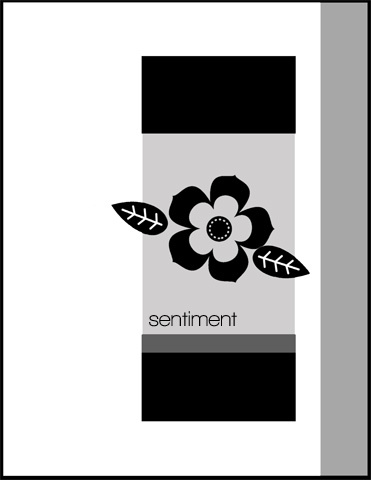 I stamped my sentiment with versa mark ink and embossed it with Silver Embossing Powder. Be sure to visit both H2H and Mojo Monday for more beautiful artwork! October 1st is the Stamp of the Month Blog Hop so come back and take a ride! We'll be showcasing October's stamp - Holiday Magic! With each new Idea Book that Close To My Heart releases, consultants get a chance to submit artwork showcasing new products. There are several categories. Winner's are selected by Close To My Heart and each piece of art is showcased on Close To My Heart's main website under the category - Ideas & Inspiration > Make It From Your Heart Art Gallery. I'm always in awe of the artwork that is selected. We have some VERY TALENTED consultants out there and I have never considered myself as talented as most. I debated on submitting my project and 3 days before the deadline, I decided "What the heck I'll submit it." So I did. August 31st was long past and here we are half way through September. I decided that I didn't get selected. I came home from work to an empty house - no one home but me. My husband is out of town and my daughter off doing her Friday night teen thing. It's just me and my dog Remi. I checked my email and I see the subject line.... "MIFYH Contest". Oh probably the "Thank you for your submission but you weren't selected" email. But no! Am I reading this right? It's saying Congratulations!!!! I read it and re-read it. I start crying and squealing happiness at the same time. Remi wasn't sure what was going on but felt the need to comfort me so began licking me trying to calm me down. I had only one 'person' (he really thinks he is a person) to share the news with and he just didn't get it. And yes, this really is a gift. I had already decided long before I thought about the contest that I would make this box and fill it with handmade cards of the same paper as a special gift for my grandma. She loves to send hand written notes and cards to friends and family. Now it is extra special. Be sure to visit Close to My Heart's Make It From Your Heart Art Gallery to see all the other talented winners! I'm about over Fall already! Not the weather... it's finally cooling off from the HOT August/September days we've been having. But I've been creating fall cards out the wazoo lately and I think I created my last two this past weekend! I can tell the leaves have all fallen off that tree in my brain. I combined the sketch from Clean and Simple Stamping and the challenge from Cas-ual Fridays - create a CAS project using a least 3 shades of a monochromatic color PLUS brown! My monochromatic colors are New England Ivy, Olive and Olive in 2nd generation stamping. I used Chocolate ink to contrast. The stamp is from Harvest Happiness (C1463). I sued Olive twill ribbon from the Designer Ribbon Green Collection (Z1616) and a little pewter buckle from Foundry Metal Accessories - Ribbon Slides (Z1460). Of course, I had to use my Art Philosophy cricut cartridge to stamp my sentiment! Now on to some 'COLDER' season cards! Check back later this week - I've been working on a snowflake card! I couldn't resist Play Date Cafe's colors. I searched around for a stamp that would remind me of fall but I didn't want leaves. I came across Joyful Jar. It had candy corn on it! Candy Corn means FALL to me! I have this rule.... never buy Candy Corn before October 1. Well, I've already broke that rule. Actually twice already. Really not sure why I have that rule - I never abide by it. Joyful Jar is a really cute stamp. Not only can you fill your jar with snowflakes, you can fill it with presents, snowflakes, leaves, hearts and more. Check out this stamp HERE. 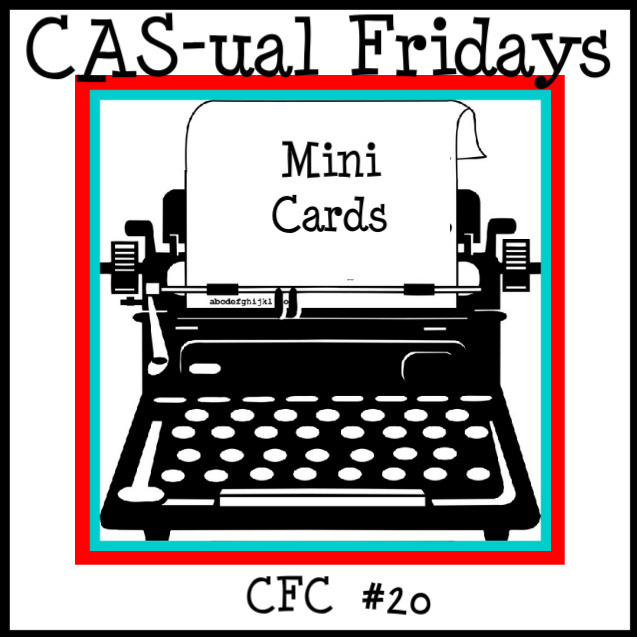 It's a Masculine Card for Another Friday Mashup! I pulled out the Typeset (X719B) paper for this card and used the stamp Key Moments (B1392) for this 6x6 card. The card base is Kraft Cardstock. I've always been partial to pinks and browns. So when I saw Wednesday's Color Throwdown I couldn't resist a break from all the autumn colors occupying my palette lately. Refreshing! I used these colors with the sketch from Tuesday Morning Sketches. So Tuesday's Sketch + Wednesday's Colors = Cherish Today! I used all cardstock for this 5x7 card. The images are from the stamps Love Life (D1482) and the sentiment from 10 Things (C1474). I used the Art Philosophy cricut cartridge for the cocoa frame then finished the card with a little bling from the Clear Sparkles (Z1104) and a pin from Bling Assortment (Z1466). I think this might make a great Birthday Card for a teenager girl! I'm so excited! Tonight I'm very honored to have received a blog award! Thanks so much to Pam Trostle for this award!! You can check out Pam's awesome blog here, if you like her creativity as much as I do make sure and follow it! She's got the CUTEST Harvest Theme on her background right now! I made this cute little treat bag with the Art Philosophy cricut cartridge and used the So Grateful stamp for the pumpkin and leaves. I stamped the pumpkin in Honey ink first and rolled the edges in Goldrush to give it some shading. I used the same technique on a couple of the leaves with Chocolate ink. Using only chocolate ink, I used 2nd generation stamping and then rolled the leaf in chocolate. The strip at the top of the bad is a zip strip from the Dreamin' paper pack. And my tag, of course, is cut from the Art Philosophy cricut! This is a FAST and EASY bag that I can fill with candy use as a fun little thank you for a special friend. I'm also submitting this in the Crazy 4 Challenges this week! Their challenge was to create anything with a pumpkin! I saw some really cute ideas there so be sure to check them all out here. I LOVED this sketch on the MoJo Monday Challenge blog and I knew immediately which paper pack I'd be using. Is it any surprise that it would be Dreamin'? I'm eatin' this pack up and I just might have to order more. The colors are so rich and fun to work with. 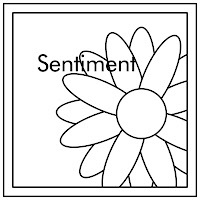 The sentiment if from Hooray Bouquet (that has been my go-to stamp lately! - LOVE IT!) The antiqued copper charm is from the Harvest Charms set that coordinates perfectly with the Dreamin' Paper Pack. I used some Mocha Opaque Adhesive Gems on the banner, and don't you LOVE that wide striped ribbon! This can be purchased in a bulk roll of 5 yards which is great for me! I don't feel like I have to be stingy with my ribbon! This week's challenge over at Heart 2 Heart is to create a card using only cardstock. I've been using a lot of Goldrush lately and wanted to change it up a little. So I chose the colors of Honey, Olive and Desert Sand. Three of my favorite fall colors. The other night I pulled out a new stamp - Unscripted (C1465) and used it for a CAS 4x4 Card (See it HERE). I really wanted to use this stamp again. The pattern I envisioned on my card actually came out the way I wanted! The pattern for my card is the sketch "Upright" from Originals. Each colonial white square is 1 3/4 x 1 3/4 but before I cut each square, I cut one piece 7 x 1 3/4 and stamped it. Then I cut it into the four squares. The ribbon is from the Honey Mini Medley Accents and I adorned it with Pearl Adhesive Gems. Hope you enjoyed my card! Be sure to check out more art over at H2H! 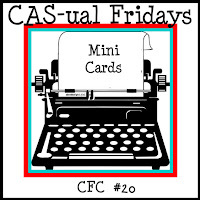 The challenge this week over at CAS-ual Friday is to create a mini-card. The only rules - must be 4x4 or smaller - and Clean and Simple of course! It's funny..... this is one of those cards that I thought I already knew what papers and stamps I wanted to use, but by the time I finished, the paper was different and the colors I had started out with were totally set aside and different colors were brought in. I really like the way this card turned out. I used a new stamp with this one - Unscripted (C1465). I used the 2x2 background stamp in chocolate ink to create the lattice print. 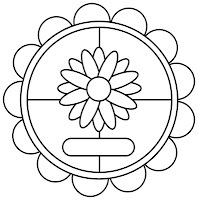 For the flowers, I used chocolate ink on the stamp and then wiped away the ink on each flower leaving the stem still chocolate. I used a Pacific Exclusive Marker to color each flower. The image is actually a small 'bundle' of flowers. I felt I needed more, so I used the masking technique to add more flowers to the bundle. An Autumn Card for Friday Mashup! I found another fun challenge blog! It is called Friday Mashup. They give you a choice of 2 challenges or you can 'mash it up' and do both together! 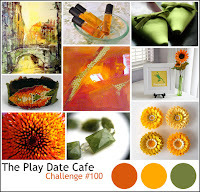 Their challenge this week was to create an Autumn Theme project or create something with Yellow and Orange. OR, mash it up and create something Autumn with yellow and orange! Since I'm in such a "Fall" mood this was easy to do! I pulled out my Dreamin' paper pack and my Harvest Happiness stamp and got to work. I used the Arts Philosophy cricut cartridge to cut out the acorn and leaves for my coordinating stamps. I used Goldrush and Honey inks for leaves for my 'yellow' and 'orange' colors. Be sure to visit Friday Mashup for some more inspirations for autumn! I was going strong this week with my creativity and I had a goal to complete all 4 Moxie Fab sketches before the week was out. I achieved my goal but I think my creativity was waning near the end. I was not entirely happy with the last card but I wanted to share it anyway since I used a new to me technique. It's called Ghosting. How appropriate for a Halloween card! The idea for this card came to me as I was actually trying out this technique on another card I was creating. That seems to happen to me alot. I used the Arts Philosophy cricut cartridge to cut my card and the frame for the card. My image is stamped on Colonial White cardstock and I sponged it with black ink. I sure had fun cutting out that spider! I used a piece of 3D Foam tape to make it stand out on the card and even curved it's legs a little! EEEK!! The paper I used is from the Mischief Level 2 Paper (X7144C) kit. The stamp is All Hallows Eve (C1462) If you like Rub-on's there are some really neat Mischief rub-ons that compliment this paper (X7144C). You can see these Rub-ons HERE. Stay tuned! Tomorrow is Friday and there are 3 new challenge blogs that hopefully I will be playing along with. I did it! I said I wouldn't but I did. I went ahead and created another card when I said I was headed to bed. But this one is so clean and simple it took just minutes to create! This is card #3 for the Moxie Fab card challenges. This time I used the Vertical Sketch. Even though I originally wanted to create a card with pennants like the picture shows, I thought I'd try something a little different. So instead I used some Elemental Compliments - which are dimensional elements in color! I'm so loving this Kraft cardstock with the Elemental paper. They go so well together. I didn't think Elemental would be one of my favorite packs but I really do like working with it. There are so many options because of 6 different colors and patterns. The strip centering the Sorbet cardstock piece is the Zip Strip from the pattern paper. Our pattern paper now has a 1/2" strip that you trim off the paper. The zip strip contains the paper pack info such as name, item number, colors used in the paper pack. (I used to hate having "CTMH" logo stamped right onto the paper!) So now all the info we need is on this zip strip - but to make it useful, on the other side of the strip is a pattern that you can use like a ribbon! Sometimes they have words or phrases which are useful too. Now I have one more sketch to do! This one I'll have to think about for a bit. In the meantime, see all the other artwork for the Vertical Sketch on Moxie Fab - HERE. It's Wonderland in Moxie Fab! I said I was going to attempt to do all 4 Moxie Fab sketches this week and after tonight, I'm half way there! I almost started this one last night but it was getting late. I knew if I started it, I would be up well past 11:00 pm and I do get up very early for work. So I went to bed with this sketch on my mind and thought about my idea all day. I silver embossed a snowflake onto a 2" square of Crystal Blue Cardstock. Then I cut it into quarters. Instead of using the 4th quarter, I used a big Rhinestone Designer Brad. (Don't you just love that BLING?) My sentiment is also silver embossed. I added Bitty Sparkles to the snowflake pattern in the paper. Hope you like it! Now on to the next sketch! Check back soon! In the meantime, check out the other creative ideas for this sketch over at Moxie Fab. I came across the Moxie Fab blog a few days ago and they had several card sketch challenges - 4 as a matter of fact! Each sketch looked fun and I wanted to give them all a try when I had a chance. I got busy and totally forgot until I saw a card created by my scrappin' bud Mandy. (See her cards over at Scrappity-Doo-Da). So tonight I sat down and re-visited Moxie Fab and checked out a few other challenges. Over at the Heart 2 Heart, their challenge was to create something with die-cuts. My first Moxie Fab sketch goes well with the H2H challenge so I'm submitting them for both! Here is the Moxie Fab sketch: "Shaped Sketch Challenge"
Now, hop on over to Heart 2 Heart and check out the other die-cut artwork! Then hurry over to Moxie Fab. You'll see lots of great art on both blogs! I'm headed back to my scrap room to start work on the other Moxie Fab sketches! Following is my complete recipe for the card! 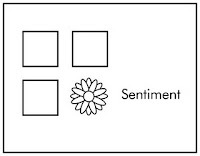 Card <Circle 3> 4 1/2"
Layer <Circle 1> 3 3/4"
Circle - cut in 4ths - <Circle 1> 3 1/2"
Flowers - <Flower 6> 2 3/4", 2" and 1 1/4"
Sentiment - <Rectangle 8> 1"
After creating a few fall cards I suddenly remembered that I needed to make a Birthday card for a co-worker. Stepping away from the usual bright Birthday colors I went for something a little more in line with the colors and patterns that make me think of September. Close to My Heart's Dreamin' paper is perfect for this. Trial and Error = Embossed! 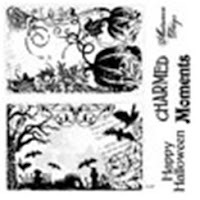 I pulled out my Background - Charmed stampset this morning to create something with the stamp that had pumpkins and vines. I used this stamp set the other day to make a Halloween card. You can see that post HERE if you missed it. I wasn't sure WHAT I was going to do so it took several efforts to finally get to my final product. Each time I stamped the image I thought of a 'better look' and proceeded to create the idea. You can see here - it took me 4 tries to get to the stamped image that I was happy with! I started out with Olive on White Daisy. Hmmm.... this might look better with Chocolate Ink on Olive Cardstock.... Well maybe Chocolate Ink on Goldrush cardstock. Still not there! HEY! How about Cocoa Embossed on Goldrush? FINALLY. I used Elemental paper along with Dreamin' paper for my 5x7 card. The Elemental Paper just mixes in with any of the other Level 2 Paper packs so well! I added the chunky chocolate ribbon and a ribbon slide with a final touch of Cocoa Opaque Pearls to complete my card. The temperature finally cooled down to a 'fall-like' level this week and this has me yearning for the colors of fall to hurry up and get here! BTW - when the temperature falls below 62 degrees, I absolutely have to make my first batch of the chili of season. When I headed home from work on Tuesday it was 59 degrees - So we had Chili for supper! This fall like weather has got me in the mood to make some cards and over at the Crazy 4 Challenges blog the colors to use this week are perfect! I had my colors, now I just needed a sketch to get me going. I checked out the sketch over at Clean & Simple and immediately I knew what I wanted to do! So armed with my Close To My Heart colors and my favorite stamp for THIS week - So Grateful, I got started! I'm not done with fall cards! I'm still creating so check back for more ideas! This week's challenge over at Pal's Paper Arts is to create something Halloween themed. So, once again, I reached into my box of new Close To My Hearts stamps and pulled out a stamp that I've been pondering over. The stamp is Backdrop - Charmed (D1490). This stamp has two large stamps (about 4 x 2 1/2 in size) that look great but I just wasn't sure how to incorporate them into a card. I was excited to finally have a chance to work with it and I'm quite pleased with how it came out. On page 47 of the Autumn Winter Idea Book, the artwork shown uses the stamp as a background stamp on their base page of a layout. This looks pretty cool but I didn't want to cover up the design. I wanted to do something to show off the design. The paper is from Mischief Level 2 paper (X7144B). I used Sunset Mini Medley accents (Z1338) along with a bit of Black grosgrain ribbon and a Black Button Brad from the Black Mini Medley Accents (Z1393). All products are Close To My Heart! Close To My Heart posted a video showing the Base and Shade technique using the So Grateful My Acrylix stamp. (I have included the video at the bottom of this post.) This stamp is in my new collection of stamps but I haven't had a chance to use it. I have been waiting for inspiration. 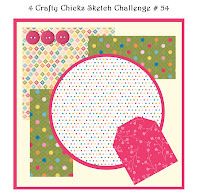 Today I was browsing through my list of favorite challenge blogs - doing this usually gets my mojo going - and 4 Crafty Chicks had a cute sketch I wanted to try out. I had all the inspiration I needed! For my 6x6 card I used paper from CTMH's new Dreamin' Level 2 kit. The Chocolate and Bamboo cardstock is included in the paper pack. I LOVE these colors. They are so rich and great for fall layouts and cards. The acorn tag was cut out with the Arts Philosophy cricut cartridge. I slipped a piece of sunset pattern paper behind the cut out acorn. Here is a short video from Close To My Heart that demonstrates the base and shade technique with this stamp. Close To My Heart's Typeset paper is perfect for those school layouts! When I finished creating the feature layout from the Typeset Workshop On The Go (G1024) kit I then set out to create the optional layout. You can find optional layouts for each WOTG kit on my website under Workshops On the Go. The cutting dimensions for the layouts are from the wonderful how to book - Magic. I really liked the optional layout shown but I wanted to change it up just a bit to include the Typeset Compliments (X7139B). They are just too fun to leave off! The only 'change' I made to the actual pieces of the layout was to flip the 'postage' piece over to the other side that was cut using the Arts Philosophy cricut cartridge (Z1686). By changing from the juniper damask pattern to the 'aged' notebook pattern I was able to incorporate many of the compliments. After completing the layout, I created these five cards - another bonus project found on my website! I only added one sheet each of Desert Sand, Bamboo and Cocoa cardstock. Four of the 4 1/2 x 4 1/2 card bases were cut with the Arts Philosophy Cricut Cartridge. I also used the AP Cartridge to cut several of the shapes. My cricut sure has been getting lots of use since I got this cartridge! It has been so much fun!